Time is the most powerful element in the universe. Time can work for you or against you. All companies, regardless of size or resources, must operate within the same time frame. Time is the great equalizer. Using the the element of time to your advantage and leveraging your current resources with a well-orchestrated marketing approach is what strategic marketing is all about. Strategic marketing allows you to recognize and seize opportunities by gaining an in-depth understanding of your marketplace and making the best use of your time, money, and resources. You may not be able to outspend your competition, but with a good marketing plan, you can outsmart them. 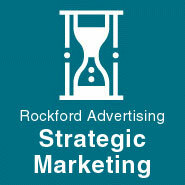 At Rockford Advertising, our marketing partnership with you begins with research and an analysis of your current market conditions. We identify your strengths, weaknesses, and opportunities. We help you define your marketing objectives. We develop comprehensive strategies and creative concepts based on the real world. And since time doesnt stand still, we work with you each step of the way to implement your strategic plan, helping you achieve your objectives within your marketing budget. Whether its a brief five-page outline or a 100-page document backed by volumes of market research, if you plan to succeed, you need a strategy and a plan.